Stockport Quaker Meeting House opened in April 2015 and replaces an earlier building on the same site. The new structure, designed by Bernard Taylor Partnership has been conceived as a showpiece green building for the town. It is designed to take advantage of the most recent developments in sustainable design and carries an Energy Performance Asset Rating of A24. The triple-glazed building boasts 500mm of roof insulation, 150mm of floor insulation and 75mm wall insulation. The roof is fitted with solar panels, energy-reducing LED lighting throughout, gas central heating and a hot water return valve to reduce water consumption. 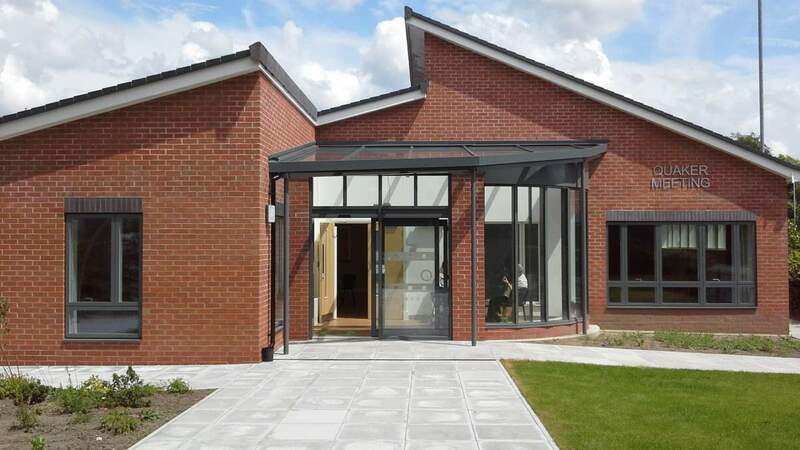 The single-storey building contains two meeting rooms, a large and well-equipped kitchen and male and female single-cubicle toilets and a wheelchair accessible toilet with its own wetroom and shower. A further office is reserved for members of the meeting and not available for hire. All rooms are accessed from a spacious central foyer. There is car park with spaces for 12 cars, including two disabled parking spaces, and a separate shelter for secure bicycle storage.